Kathy Parchuck, children’s library assistant teams up with culinary artist Theresa Corrigan, proud grandmother of eight and former student of the Culinary Institute of America. 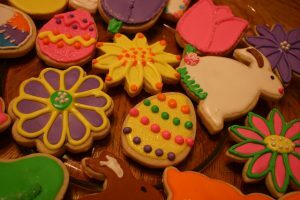 Theresa will share her icing techniques and whimsical style to help you and the little ones turn sugar cookies into edible works of art. While this program focuses on grandparents and grandchildren, families in general are warmly invited. So hippity hop on over to the library with your favorite Easter bunny to create festive springtime treats! This event is free and open to the public. It will take place in the community room, which is wheelchair accessible. To register for this workshop, call 518.828.1792 x101, email programs@hudsonarealibrary.org, or visit the main desk in the library. This entry was posted in Adults, Children, Programs and tagged Children's Area, children's programs, City of Hudson Senior Center, crafts, Senior Programs by smcintosh. Bookmark the permalink.